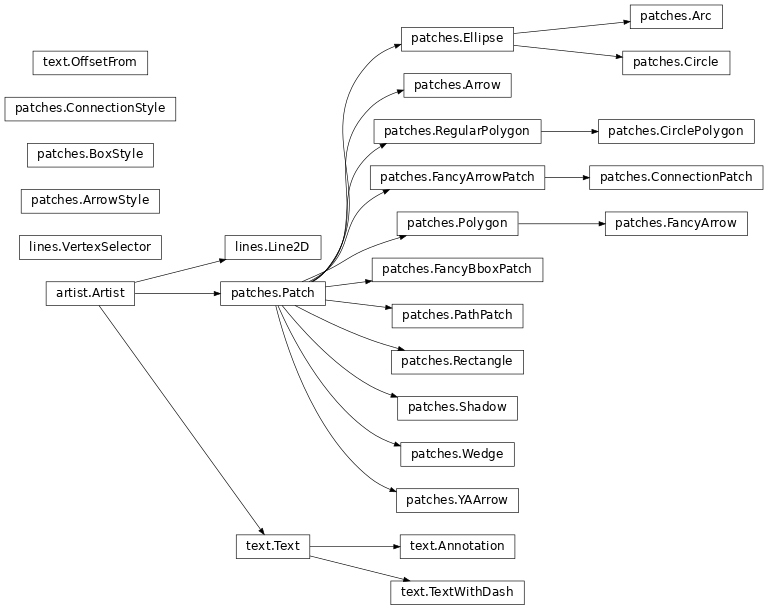 Note there is a problem for Artist __init__ methods, e.g., matplotlib.patches.Patch.__init__(), which supports Patch kwargs, since the artist inspector cannot work until the class is fully defined and we can’t modify the Patch.__init__.__doc__ docstring outside the class definition. There are some some manual hacks in this case, violating the “single entry point” requirement above – see the docstring.interpd.update calls in matplotlib.patches. If provided, the code will be run in the context of all previous plot directives for which the :context: option was specified. This only applies to inline code plot directives, not those run from files. If the :context: reset option is specified, the context is reset for this and future plots, and previous figures are closed prior to running the code. :context:close-figs keeps the context but closes previous figures before running the code. Whether to show a link to the source in HTML. By default, rcParams are applied when context option is not used in a plot directive. This configuration option overrides this behavior and applies rcParams before each plot. Provide a customized template for preparing restructured text. Contact Michael Droettboom for the login password to upload youtube videos of google docs to the mplgithub account.